Green Lawn Service has been providing lighting and landscape design/installation services in the Cleveland area for years. 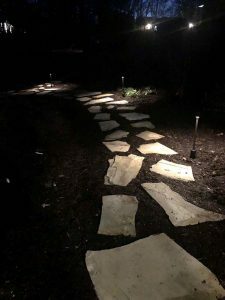 From paver patios and fire pits and places, we can help you obtain the landscape of your dreams with lighting to accent in all the right places. Your home will quickly become the envy of the neighborhood with an outdoor living space perfect for making memories. We have the talented professionals and equipment needed to create your outdoor oasis. Our team is sure to consider every detail of your project so nothing is overlooked and that your lighting project looks perfect after the installation is complete. We use the latest training and technologies to ensure that your lighting installation will last for years to come with a guarantee that we hang our hats on.